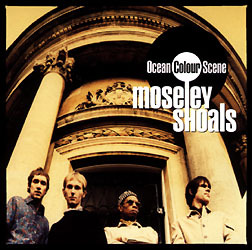 Listen to this disc and you'll understand why Oasis called Ocean Colour Scene their favourite band, for they, like Oasis, blatantly rip off the Beatles -- amongst other bands like the Rolling Stones, Led Zeppelin and the Doors -- throughout this CD. After convincing myself that this was not a long lost album by any of the above-mentioned groups, I came to the conclusion that Ocean Colour Scene have neither the individuality nor the personality it takes to produce an exciting and influential album. Which is a shame, because they sound like they have the talent to produce some great sounding music. This all leads me to believe that Ocean Colour Scene are either too lazy to try something new or too scared. They're a tight-sounding quartet who fill their songs with catchy guitar hooks, a solid rhythm section and sympathetic piano fills -- but the sound they create was all done 30 years ago. Bono said it best: "You glorify the past when your future dries up." Ocean Colour Scene have no future if they continue to be a second-rate Beatles or Doors.